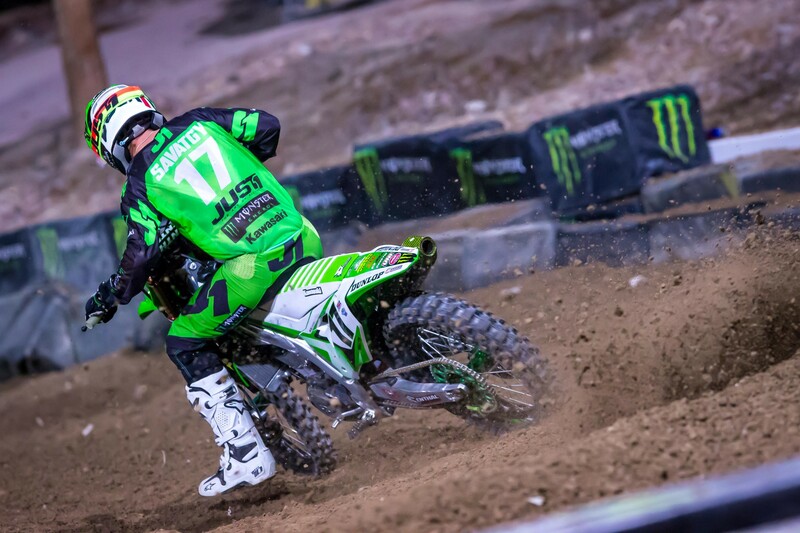 This year’s Monster Energy Cup nailed the formula perfectly. 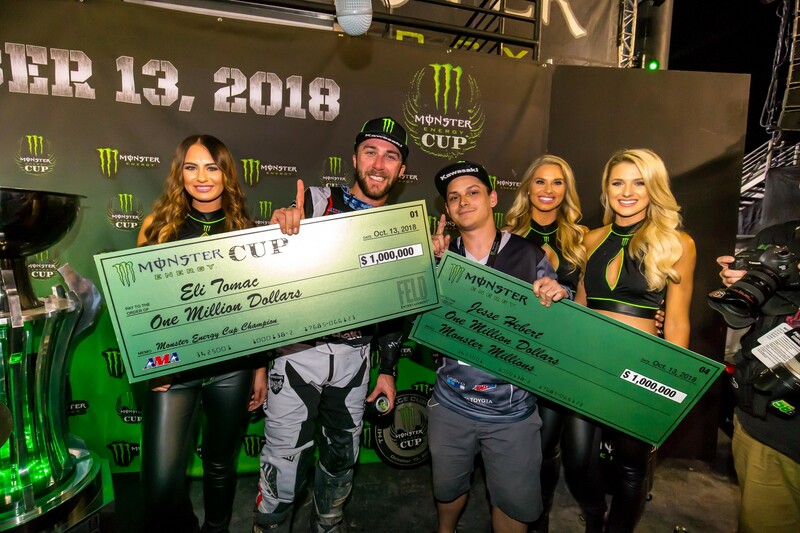 The Monster Million-dollar reward, held for a rider who can sweep all three Cup Class races, has been captured twice in the history of the event, but those came through holeshot and check out final rides that were pretty much drama-free. That wasn’t the case this time. 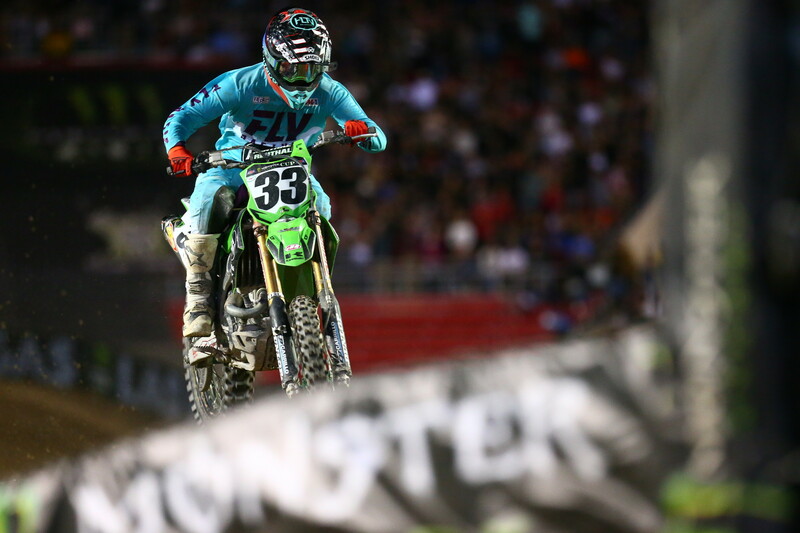 Eli Tomac won the first two races of the night but got bumped around in turn one of race three. That set up a heart-stopping charge through the pack that had the fans cheering Tomac’s every move. Adding further to the drama, this year’s race had a new wrinkle in which a fan could also win a million dollars if a rider pulled off the sweep. Jesse Hebert from Greenbelt, Maryland was the fan with a shot at it, so on the final laps, the fans were cheering Tomac, and Hebert was going insane with each pass. By the last lap, Tomac had one more pass to make—on his Monster Energy Kawasaki teammate Joey Savatgy—to get the dough. In the back section of the course, Savatgy slowed and took a hand off the bar to motion to Tomac. Eli rode past, into the lead, into the Monster Million, and Sam Boyd Stadium roared. Hebert did, too, as this sweepstakes winner had also taken home a million dollars. "I was just full on, that's all there was to it," Tomac said on the podium. "It was just wide open; I was making the passes, and then it was just all the way 'til the end. This is just insane. Unbelievable." The Savatgy move added to the discussion after the race, but Tomac did a whole lot of the work himself with a furious final five laps, making passes on a track that didn’t offer much opportunity for moves. When he got desperate, he just started sending it bigger through the sand, and going even faster through the mega-fast sweeper in the back section. For Tomac, a sweep under pressure was nice retribution after last week’s struggles at the Monster Energy Motocross of Nations. Lest you think the million dollars has healed all wounds from last weekend for Tomac, don't worry, his heart is in the right place. 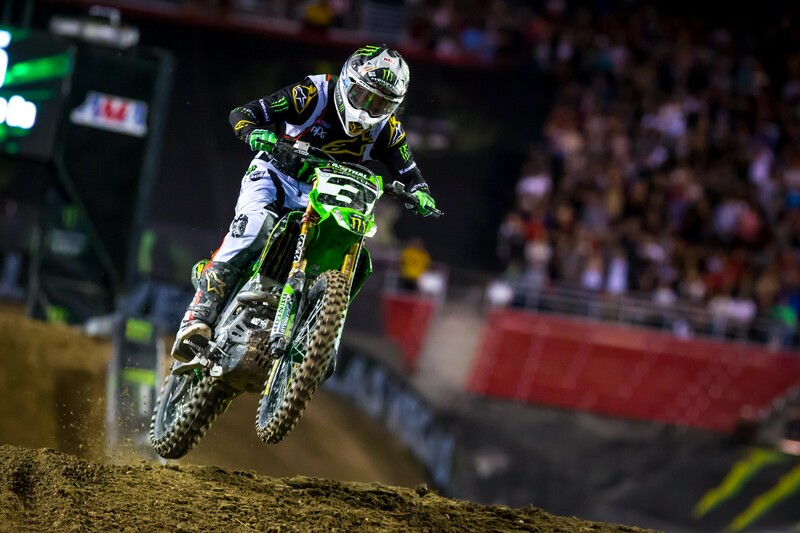 "Last week is still in my head and in my mind, it’s still bugging me and bugging us," said Tomac. "I know we're better than what we finished, but that's racing. I think it probably added three years to my career because I want to go over there and get some revenge on those guys. But overall, though, we did just get straight-up beat." Savatgy might be getting some heat again, but that shouldn’t overshadow how well he rode. The new Monster Energy Kawasaki 450 rider was in the top five in all three practice sessions, got great starts in the races, and culminated it all by getting a holeshot and leaving the field behind in race three. This all put Joey in a tough position on the last lap, as Tomac needed the pass to collect a million bucks. Joey lost the race win, but he was still smiling when it was over. For a 450 debut, it was good. In the post-race press conference, a reporter asked if Tomac might give Savatgy a percentage of the million? “No comment,” said Tomac, and the room laughed. Savatgy actually would have had second overall if he won that final race, he ended up edged by Rockstar Energy Husqvarna’s Jason Anderson. 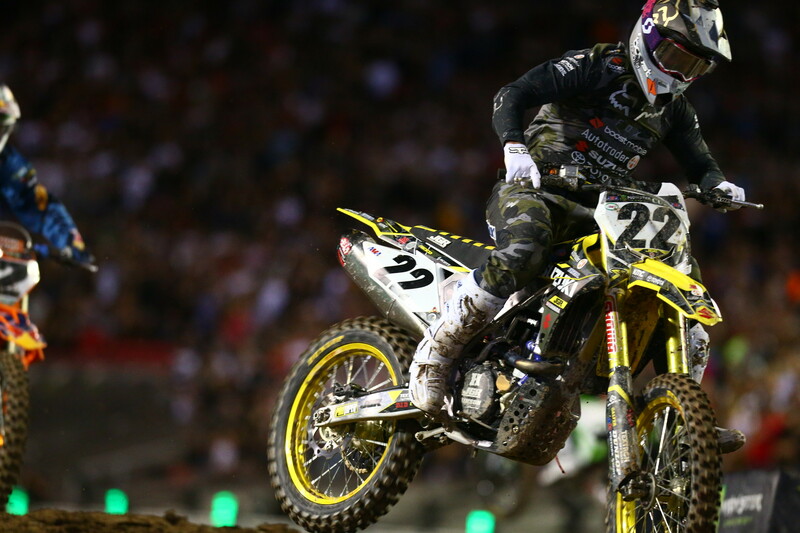 Anderson was on the fence about doing the race—saying at mid-week he was out, then deciding on Thursday that he was in. Anderson rode well all weekend but completely blew the start in race two. That led to 3-5-4 scores. Marvin Musquin caught all the breaks at this race last year to net the Monster Million payday. This time things didn’t roll his way. He didn’t get great starts, then got tangled with riders in the second and third races and ended up with 2-9-21 scores for 11th overall. 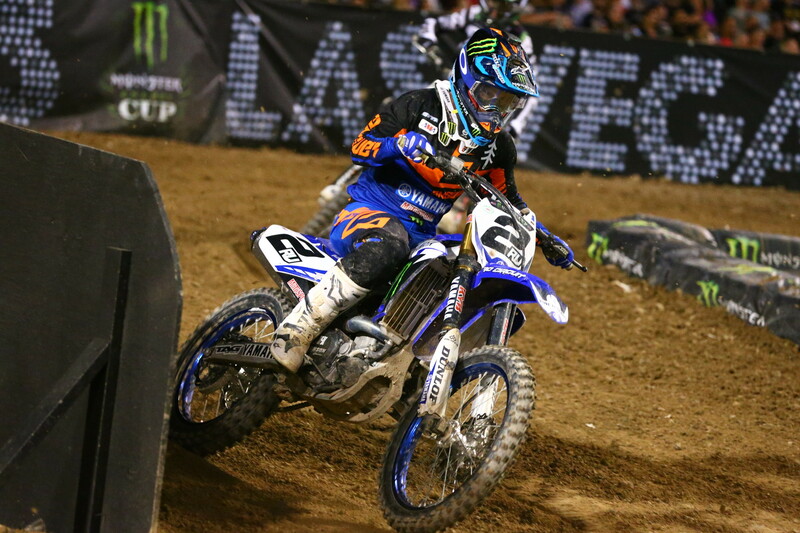 Monster Energy Yamaha’s Justin Barcia had a quiet night and ended up fourth. He and Anderson found themselves closely matched throughout the night but both had to come through traffic a few times after less-than-ideal starts. Barcia went 4-2-7 in his three races. Stewart, on the Smart Top/Bullfrog Spas Honda, went 7-4-6 for fifth overall. 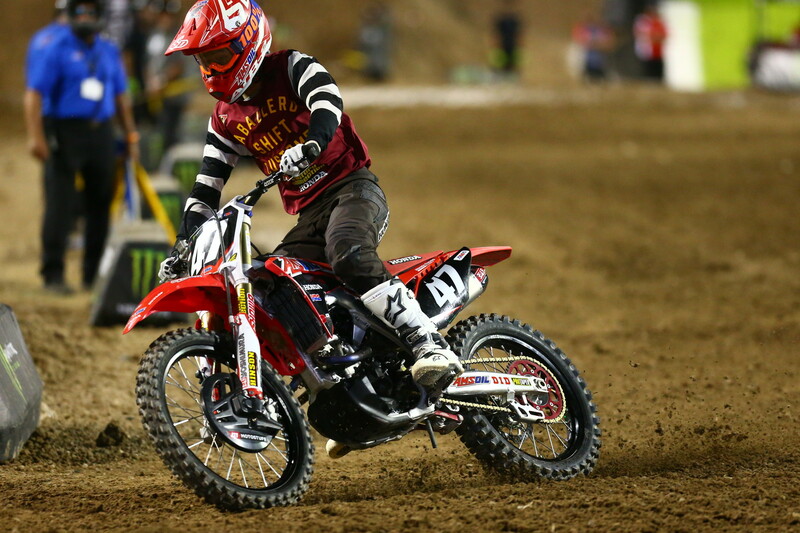 In the Amateur All-Star class, Amsoil (GEICO) Honda’s Jo Shimoda won a heated battle for the overall that could have gone to four or five others. Shimoda, who raced B class this year in the amateur ranks, looked smooth and in control all day, but actually said he felt tight and uncomfortable most of the time. He made it happen in the races, though, outdueling Rockstar Husqvarna’s Jalek Swoll in race one to get the lead, and then holding off a furious charge by Kawasaki Team Green’s Seth Hammaker to hold on for the win. In race two, Troy Lee Design’s Red Bull KTM’s Derek Drake checked out with the win, but a bad start held him to sixth in the first race. This left Shimoda, Swoll and Hammaker to fight for the overall. All three battled into the final turn, Swoll taking second, and Hammaker crashing to try to make a pass on Shimoda. Shimoda’s 1-3 was enough to edge Swoll’s 3-2. 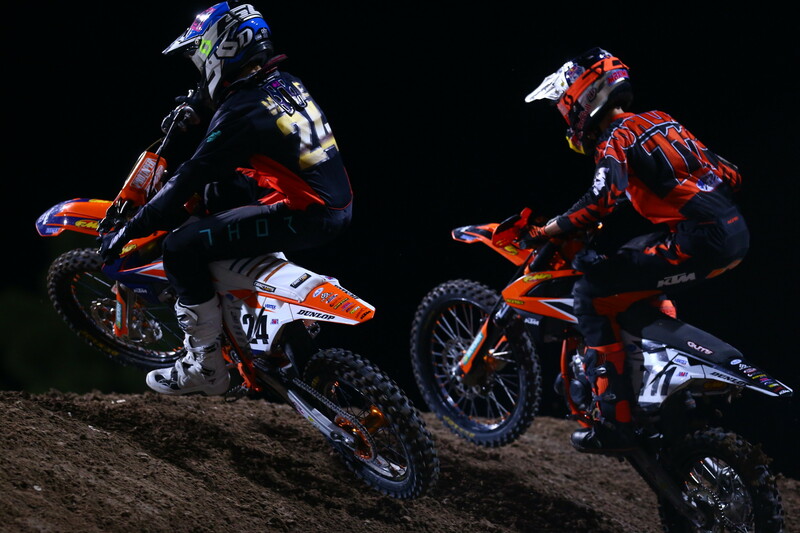 Vohland had to battle hard with fellow KTM rider Josh Varize. They put on a great show in race one, with Varize taking second, but then Varize crashed into the back of Jack Chambers in race two and finished eighth. Rides Unlimited backed Kaeden Amerine came through traffic in both races to net 3-2 scores and second overall.